People have their own preference over things; one cannot insist others to choose a particular item against their will. But, understanding the value before buying can make a big difference. In the world of writing instruments, most pen enthusiasts choose a writing tool by relying on the outer appearance. Question yourselves “Why would you choose a rollerball pen over a ballpoint pen", you would probably point out that rollerball pens are loaded with smooth gel ink which glides smoothly on the writing surface and makes writing process convenient. But, a single point doesn't conclude the whole decision. There are various other criteria that one has to look into before choosing the correct writing instrument. Ballpoint pens are simple writing tools. They were invented around 1950's as a convenient writing device to put an end to the monopoly market of what was at the time the only option - fountain pens. Ballpoint pens quickly made fountain pens dissipate and reigned as the most demanded writing instruments. Every ballpoint pen includes a small tube (refill) filled with paste ink. The paste ink backs up the small ball tip, and when you roll the ball across the page it draws the ink onto the paper. Before we move forward I would like everyone to know that ballpoint pens are designed as a utility tool and not for the pleasure of writing experience. The first point that I would like to bring out is versatility. Ballpoint pens can be used with almost all kind of writing papers without the fear of smearing and they leak rarely compared to their counterparts. Though some of the words can be imprinted on the back of the page but it doesn't bloat the paper like fountain and rollerball pens. Another point I would like to point out is its compatibility with left-handed writers. Unlike fountain, rollerball and fineliner pens, words written with ballpoint pens dry very quickly without smudging your hand or paper. Rollerball pens are upgraded version of ballpoint pens. The working mechanism of a rollerball pen resembles with a ballpoint pen but instead of using paste ink it uses gel based ink. With rollerball pens your words will be darker and uniform, and while purchasing a new refill there are more color options to choose from. When it comes to consistent flow, rollerball pens stand a notch above ballpoint pens and are considered best by pen enthusiasts who prefer writing experience similar to fountain pens. Unlike ballpoint pens, rollerball pens require less pressure on the paper and are comfortable to write with. Another best part about writing with a rollerball pen is the ink on the paper will be more dramatic and clearer. And without putting much pressure in hand and the writing instrument you will be able to jot down your words. Now that we have learned about both ballpoint and rollerball pens, let’s tap into some of the factors that will help us to choose the right writing instrument. Expenses: Ballpoint tips use less ink compared to rollerball tips, which means with ballpoint pens you will require less refills. And because ballpoint pens include paste ink there is less chance for the ink to dry out when the pen is not in use. Besides, ballpoint pens are comparatively cheap than rollerball pens. Choice of Paper: Ballpoint pen refills are filled with oil-based ink, with ballpoint pens your words will flow smoothly on the writing surface regardless of the paper quality. But, when it comes to rollerball pens, the ink from its tip may soak into the page depending upon the paper quality. For thin paper its best to use ballpoint pens. Plus, rollerball pens are not the best choice for people with tiny handwriting. Upon writing the ink from a rollerball pen tends to sink into the paper and results a horrible writing experience. Feel: Rollerball pens are much smoother on paper and offer exquisite writing experience like a fountain pen. With a rollerball pen you don't have to push down hard to jot down your words on the writing surface like a ballpoint pen. Due to this factor, rollerball pens are considered best for pen enthusiasts who are prone to hand injuries like carpel tunnel syndrome and arthritis. We have discussed much on the benefits and downside of rollerball and ballpoint pens. But what about usability and user preference? A recent study on 100 pen enthusiasts revealed the following stats. 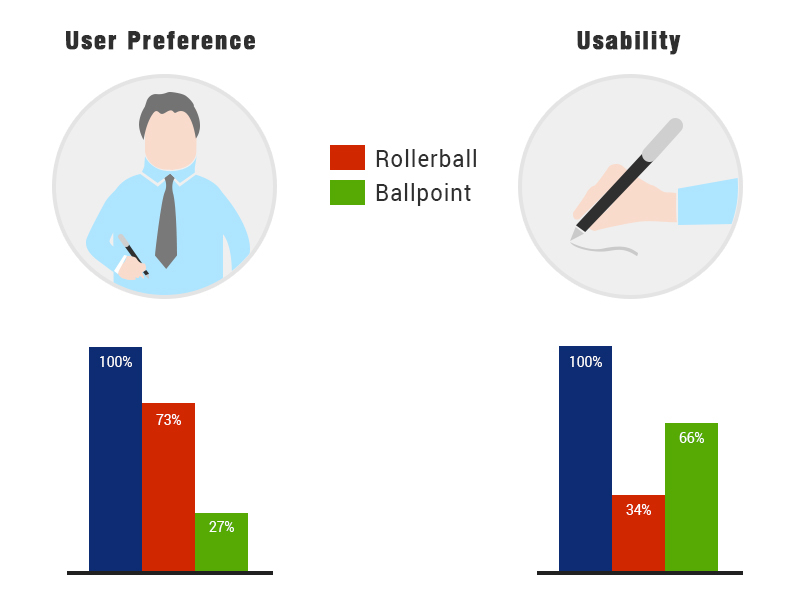 When it comes to user preference rollerball stand a notch above ballpoint pens, but in practicality ballpoint pens are more into action. · Reduces hand pressures and fatigues. · Ink on the paper will be clearer. · Best for people who love to write fast. · Good for writing in low quality papers. · Best for left-handed people.